Looking for a few last minute ideas on what to get the wee foodies in your life? I’m definitely not as organised as I’d like to be this Christmas but I decided to take a wee break from studying to put together a list of a few of our favourite things. This post isn’t sponsored and there are no affiliate links… it’s all just things we’ve bought or been gifted in the past and ideas we really love. Cooking equipment and cookery books are great at any age. Little ones love pretend play so toy utensils like Ikea’s toy pots and pans are brilliant for keeping them entertained while you cook. We also have some bright silicone spatulas and spoons from Colourworks that are good for both adults and kids as they’re suitable for use in the actual kitchen too. Little ones can start to learn to handle a knife using this Tidlo cutting vegetables set, which is also a good toy for starting conversations about veggies. From as early as around two, kids can start to help with cutting up soft fruit and veggies. We were gifted a lovely knife and peeler set from Kiddies Food Kutter last year and both my two year old and my five year old have made great progress using it. I also bought a children’s knife from Kuhn Rikon that’s a bit sharper but definitely suitable for pre-schoolers who have learnt basic cutting skills. Getting kids involved in cooking is my favourite way to encourage them to eat well. They’ll need a good apron, such as this multi-purpose coverall from JoJo Maman Bebe, as it can get really messy. There are lots of amazing cookbooks aimed at young children. We got Nadiya’s Bake Me a Story last Christmas and our favourite is still Gruffalo Crumble and Other Recipes. For slightly older children, a voucher for a cooking workshop or lessons can make a brilliant gift. 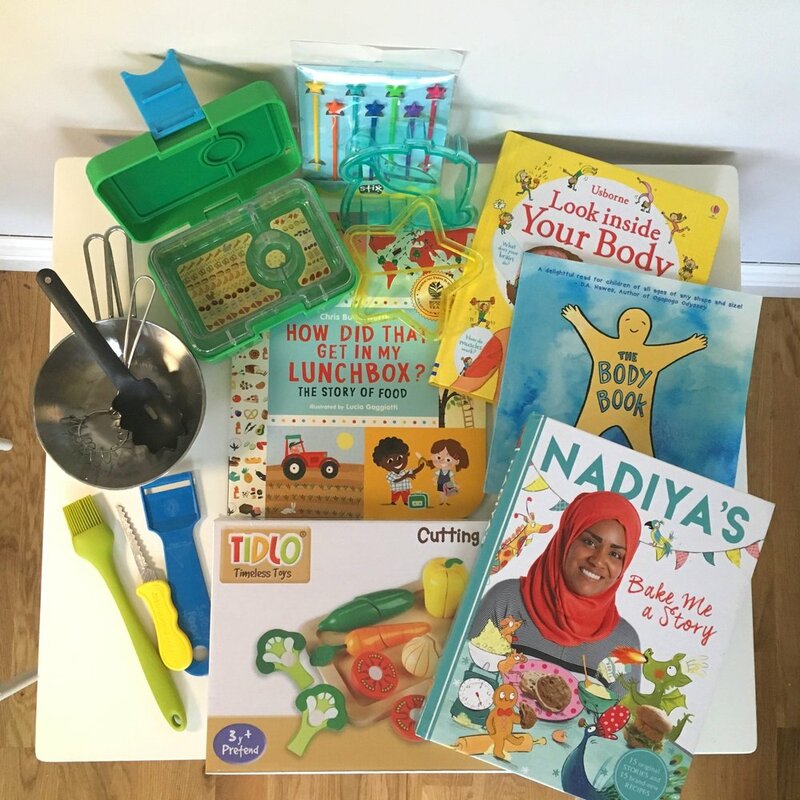 For anyone based in London, Registered Nutritionist Sam Perkins runs classes for age 6+ through Happy Eaters, and there are lots of other classes available across the UK. Wee foodies love to know where food comes from, so gardening kits or tools are another fantastic gift. Willow and Wild offer a subscription box for 3-8 year olds that includes gardening, cooking and craft activities. We tried one earlier in the summer and it gave us hours of fun. If, like me, your wee foodies’ parent isn’t very green fingered, books about where food is from can be a great conversation starter. I’ve just bought How Did That Get in My Lunchbox? for my five year old. My kids get so excited when I pack them a lunch box that looks fun and appealing. Tools like these Lunchpunch sandwich cutters and Stix make this much more realistic on busy mornings. We’ve also treated ourselves to a new lunch box from Yumbox, which is a bigger version of the snack box shown above. It’s never too early to show kids that body diversity is a positive thing. I love Roz Maclean’s The Body Book. My five year old has recently started asking more questions about how bodies work so I’ve also bought Look Inside Your Body, which I’m relieved to see has no “good food / bad food” messaging in it, unlike many others. Babies new to food are spoilt for choice with so many gorgeous weaning products around. When I asked for gift ideas on Instagram, Archie the Foodie recommended Cognikids Dip weaning pre-spoons. I also love these bamboo plates from Eef Lillemor for slightly older babies. And finally, I can’t end this list without giving a shout out to my friend, Laura Thomas, who has designed a comprehensive online course on Raising Intuitive Eaters. It would make a brilliant gift for any parent who wants to raise a wee one with a positive relationship towards food and their body. I recently asked a question on Instagram: When did your little one move from breast / bottle feeding onto a cup? Of 34 responses around a third of parents binned the bottle by 12 months, a third gradually moved from breast / bottle feeding onto milk and water from a cup between six and 18 months, and a third continued with either breast or bottle feeds (especially at bedtime) for around two years or longer. All of this is normal. When should babies start drinking from a cup? Some babies are cup-fed from day one but most begin the gradual transition from bottle or breastfeeding onto drinking from an open cup from six months or older. This picture is of my little girl having a go at drinking water from an open Doidy cup at about seven months. Yes, it was messy. We only really used the open cup for play to start with and usually used a free-flow beaker with a flip-top spout when we were out and about (we liked the basic Tommee Tippee one). It definitely took a few months for her to get the hang of drinking from a cup, and only really now at two and a half is she very confident with a completely open tumbler. My son was combination-fed and I did follow this recommendation, switching to cow’s milk in a cup when he turned one. But both my kids were breastfed for longer than a year and I know it’s not always easy to stop using a bottle, especially before naps and bedtime. I think it’s a real challenge to give parents practical and realistic advice on this, so I asked Feeding & Swallowing Specialist Speech Therapist Stacey Zimmels, of Feed Eat Speak (@feedeatspeak) and Lecturer in Oral Microbiology Dr Samantha Byrne, also known as The Tooth Fairy, to help. Why is it important to transition from bottle to cup? Why are there recommendations to continue breastfeeding beyond one year, but to stop drinking milk from a bottle? This is definitely more of a grey area! The World Health Organization’s recommendation - that breastfeeding continue for up to two years and beyond - is based on general health benefits, including reduced risk of infection (which is particularly important in developing countries). Stacey, a Feeding & Speech Therapist and trainee IBCLC lactation consultant, explained that breast milk offers much more than nutrition for a toddler. It can be a source of comfort and reassurance too. Children who are breastfed generally have lower levels of tooth decay than children who are bottle fed past the age of one year (ref). However, there is some evidence that breastfeeding on-demand past the age of 12-24 months, particularly during the night, may be associated with an increased risk of tooth decay, too (ref). What can parents do if they’re struggling to transition away from a bottle? Change the place that the milk is offered and offer it in a cup in the new place, e.g. if usually given before bed in the bedroom offer after dinner at the table in a cup. If this step is too much for your little one you can split it. Offer half the milk in a cup after dinner and give a smaller amount by bottle at bedtime and then gradually reduce the bedtime volume. You can involve the child in choosing a cup and making it special an event. Something new and exciting. You could “give” the bottles away to a new baby. Free-flow and open cups are messy. Are there any alternatives? While learning to drink from an open cup is important for both dental health and oral-motor development, the main thing is to find something that works for both you and your child. You might need to try a few different cups before you find the right one, and to try at different times of the day. What’s important is making gradual progress and taking steps to take care of your little one’s teeth as you go along. For more information on this, have a look at Childsmile. For more tips, check out Stacey’s Feed Eat Speak website or find her on Instagram here, and be sure to follow Samantha’s Tooth Fairy page on Instagram too. #bodypositive #bopo - if you’re a mum with an Instagram account, the first thing that might spring to mind is a photo of a mum rocking her tiger stripes in a bikini. How you feel in swimwear is a really important part of the body confidence conversation between you and your little ones, but to raise body positive kids, we need to start with the bigger picture. Body positivity is a social movement rooted in the work of fat activism that started in 1960s (although apparently dates back to Victorian times, when early feminists rejected social pressure to wear corsets!). It’s about being inclusive to bodies of all shapes and sizes and celebrating the beauty in the most marginalised bodies. Being body positive can include self-love towards your mum-tum (I’m still working on this myself), but isn’t complete unless it includes action to reduce the systemic oppression experienced by people who will never fit existing societal beauty standards. The cultural message that we need to change our bodies to be more attractive, healthier or morally superior is insidious… the idea that you need to “get your body back” after having a baby is an example of this. Instead of acknowledging that our bodies have done something miraculous and are forever changed, we feel pressure to return them neatly to the way they looked before pregnancy. But this isn’t comparable with the daily onslaught of stigma and discrimination that people in larger bodies experience - the assumptions made about their behaviour and health by the media, public health organisations and random passers-by. To raise body positive kids, we need to recognise and celebrate body diversity and teach our children that all bodies are worthy bodies, and never to make assumptions about people based on their body appearance. I realise that this is easier said than done if you don’t have a brilliant relationship with your own body. Last week I was lucky enough to attend a two-day workshop on body image healing led by Dietitians Marci Evans and Fiona Sutherland. I learnt so much and want to learn so much more, which is part of the reason why I’m about to start studying for a MSc in psychology. Everyone’s body has a story and we all deserve to feel comfortable in our skin. I’m especially passionate about preventing body image concerns in young children, which seem to be increasingly prevalent. I’ll go into the research on this more in future posts but, for now, what are some of the things that we as parents can do to improve our own body confidence and begin to promote body positivity in our kids? Widen your lens on what is beautiful. That might mean looking at and appreciating pictures of different bodies on your social media feed - postnatal bodies, older bodies, higher weight bodies, and so on. Help your children recognise all kinds of beauty in the everyday world - let them approach visible differences with curiosity, and chat with them about why diversity is a positive thing. How boring would the world be if we all looked the same? Separate self-care from size. Try to take care of your body because you value it, rather than to change your shape or weight. Notice how you speak about food, physical activity and your body in front of your children. Show them that you eat food that nourishes your body and soul and that you move because it makes your body feel good. Encourage your kids to enjoy what their bodies can do, too. Spend time building strengths and interests that aren’t related to your appearance at all. What really matters to you? What would you spend your time doing if you weren’t worried about your body? First published on Laura Thomas' website on 5th June 2018. We are writing to you on behalf of a group of Registered Nutritionists and Registered Dietitians who hold concerns about your most recent campaign to influence policy on ‘childhood obesity’. By talking about “war” and saying “the future of the NHS is at stake”, we worry that you are contributing to a stigmatising and divisive conversation about weight. We are asking you to think beyond your intentions, to the potential impact and repercussions and reconsider how you communicate your message. When we contemplate what is meant by health, we cannot talk about physical health in isolation, and must also consider a child’s relationship with food and with their body in the conversation. Although many current health campaigns are focussed on weight, we are addressing this with you as we know that your impact and reach is wide and what you say has the potential to positively impact millions of people. Children are particularly vulnerable to the consequences of weight stigma (bias or discrimination related to size), with higher weight children being 63% more likely to experience bullying. We know that children who experience weight based bullying or teasing are more likely to diet or to try to control their weight in other ways. Dieting and body dissatisfaction are risk factors for eating disorders. In one recent U.K. study of 16-year-old girls, 40.7% had some form of disordered eating behaviour (fasting, purging, or binge eating), 11.3% at a level compatible with a eating disorder diagnosis. Another study of 5-year old girls found that 34% were already restricting their food intake. And this is not a problem specific to girls; the eating disorder charity BEATestimates that 11% of those diagnosed with an eating disorder identify as male. These statistics aren’t surprising, considering that in our current culture we are so afraid of “obesity” that parents are engaging in weight-related talk with children as young as two-years old. Recent studies show us that, where a parent is critical of a child’s weight, however well-meaning, the child may be more likely to develop an unhealthy relationship with food and their body. This isn’t happening on a small scale or in isolated cases – it’s estimated that 40% of parents have encouraged their children to diet. This is counter-productive given that body dissatisfaction and dieting are not only predictors of disordered eating, but of long-term weight gain. Although unintended, campaigns and policies that focus on body size and weight, rather than health & well-being more broadly, contribute to weight stigma. Weight stigma has increased by at least 66% since the 1990s – far more than can be accounted for by the increase in body weight over the same timeframe. Weight-related stigma and discrimination is endemic in our society – 88% of people in a higher weight category who responded to a recent All Party Parliamentary Group survey reported having been stigmatised because of their size. Their experiences included bullying, teasing, missed job opportunities and being socially excluded by family and friends. Levels of weight bias in health professionals are particularly concerning – assumptions are made and conversations can be insensitive, leading to shame and healthcare avoidance. We are certain you’ll agree with us that there is nothing about weight stigma that is health-promoting, and may actively discourage people from engaging in behaviours that will improve health outcomes. You have described action on children’s weight as a “war”. This language is ubiquitous – the idea of fighting a battle over children’s bodies primes children to be in conflict with food and their bodies at a time when they are vulnerable to perturbations in body image and self-esteem. By positioning body fatness as the enemy, we believe that your campaign is directly contributing to weight stigma. Furthermore, the scientific evidence is clear that people can be metabolically unhealthy at a lower weight, and metabolically fit at a higher weight. For instance, people in higher BMI categories who engage in regular physical activity, eat 5 portions of fruit and veg a day, don’t smoke and drink in moderation have been shown to have a similar risk of disease as those who are of a ‘normal’ weight and also engage in those health promoting behaviours. This shows us that we can improve health and mitigate disease risk by focusing on behaviours, rather than a number on the scale. We are all in agreement that we want the best for children; to enable children to grow up in the best possible health, and to empower everyone to live lives that feel meaningful to them. No one wants to put children’s health at risk. Over-simplified solutions to any health condition or behaviour are never helpful. Any work on improving people’s eating patterns needs to be rooted in action on the social and determinants of health. We agree that protecting children from commercial influences such as aggressive marketing – of both food and unattainable beauty standards – has a role to play. It’s also important to acknowledge that the food environment alone is not responsible for people’s relationships with food and their bodies. We know that you can’t change the circumstances that people live in, and that you want to make a difference with the power that you do have. From the campaign point of view, we would love to see you refocus your message in more positive and inclusive ways. WHO recommend promoting body positivity, while simultaneously promoting the fun of movement and play, and the importance of eating a balanced diet for growing big and strong. We can learn from initiatives like This Girl Can, which inspired almost 3 million women to be more active, not by telling them that they need to change their bodies or to take action to prevent life-limiting diseases, but by showing them that a more active life is not only possible but is enjoyable too and encouraging them to take the first step towards enjoying a more active life, whatever their size or circumstances. When it comes to eating well and having a healthy relationship with food, we think that celebrating the social value of eating together, encouraging people to explore food and ensuring that children see adults eat and enjoy a wide range of foods have much more long-term value than a narrow focus on demonising “junk food”. Parental role modelling of both a healthy balance of foods and a healthy relationship with food has consistently been shown to improve dietary variety. Focus on health improvement rather than weight management – frame your message in a weight inclusive manner that promotes wellbeing for all. Advocate more strongly for reductions in underlying socioeconomic disparities that limit people’s lifestyle choices and lead to health inequality (access to adequate income, jobs, education, housing and food). Laura Thomas, PhD, RNutr., Sarah Dempster, RNutr., Helen West, RD., Rosie Saunt, RD.